"Brilliant and much like the work of James Rose work in it's reuse of things. It is sensitive to human nature--people want to live where they want to live and landscape architects can help them do so more safely." Thousands of people throughout the world die due to the natural disasters such as earthquake, floods, hurricane, and tsunami and so on, each year. Natural Hazards are defined as the dangers arising from natural circumstances that threaten the wellbeing of humans and/or the environment. These are normally taken as hazards arising from geological of climatic phenomena. Furthermore, some natural hazards can be exacerbated by human activity, such as flooding resulting from the destruction of forests. One the most spectacular natural hazards are earthquakes. The most severe earthquake in recent years killed 750,000 people in Tangshan, China in 1976. Volcanic eruptions of Kratatau in 1883 discharged ash up to 80 km (50mi) high which encircled the Earth within two weeks. Another major hazard is tsunami, enormous waves which reach maximum height near the shore where they can cause massive damage and loss of life. Tropical hurricanes are the worst and most widespread natural hazard, causing damage not only directly by wind action but also by flooding. The most serious incident in recent years resulted in 500,000 deaths in Bangladesh in 1970, while flooding of the Yangzi River in China following typhoons killed 40-50 million people in the mid-19th century. Tornadoes are rotating circular storms, particularly prevalent in the United States, which cause substantial damage by lifting large objects into the air and moving them some distance. As the result we must find ways to confront such disasters and manage the aftermath. 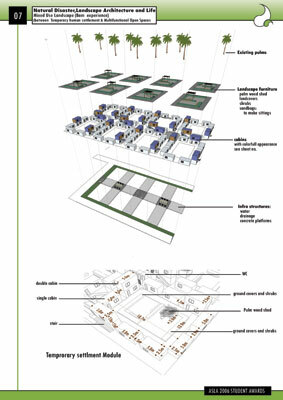 How can the landscape architecture using the natural and environmental potentialities promote the quality of life in a short term (phase 1: soon after Disaster about temporary human settlement, phase 2: Six months to three years after the disaster, other layers) after the disaster? What are the basic steps in promotion of merriment and mental wellbeing of people? 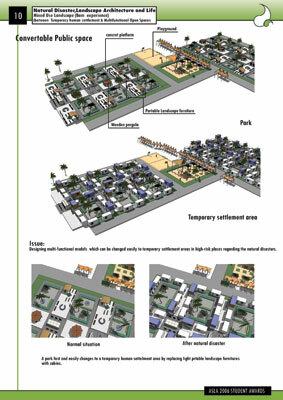 How can the landscape architecture help achieving such a condition? What are the designing techniques and elements that are useful in short term? 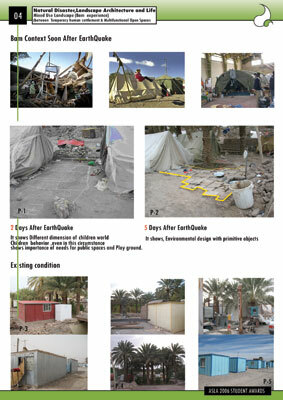 How about various methods of organization of open spaces after the disaster? Early hours of 26 December 2003, an earthquake of magnitude of 6.6 on Richter scale destroyed the historic Iranian city of Bam and killed more than 25,000 people and left some 75,000 people homeless. It destroyed both of the city's hospitals and 80 percent of homes, schools, and administrative buildings. The quake also extensively damaged the 2,500-year-old citadel of Bam, the worlds largest mud-brick structure. In a few seconds, tens of thousands of city residents were buried under tons of rubble. Bam has gone through a tragedy on an unparalleled scale. 80% of the town has in one way another experienced the loss of a direct family member, a relative, a neighbor of or a friend. 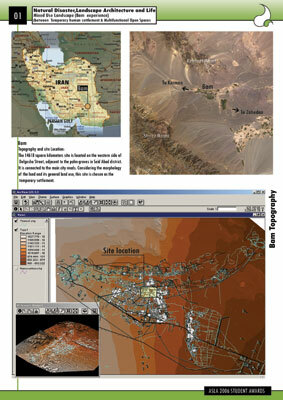 Bam is located in the eastern regions of Kerman Province along the skirts of Loot desert. 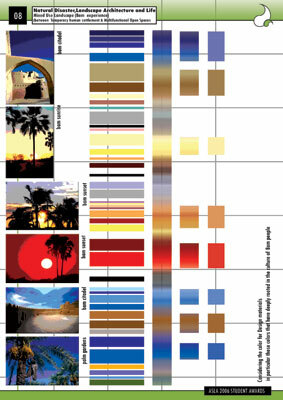 Considering the climate, impact of desert on the region is clear; the region has a dry climate. Here are some of its characteristics (this climate includes Baravat and Bam regions): temperature difference in night and day, lack of rain, irregular raining, big difference in rainfalls during a year, evaporation, perspiration and a long warm period. 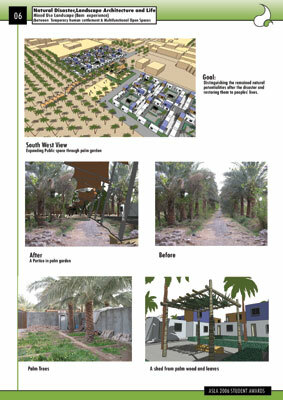 The 14,618 square kilometers site is located on the western side of Delgosha Street, adjacent to the palm-groves in Seid Abad district. It is connected to the main city roads. 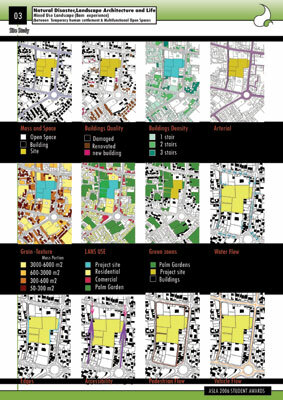 Considering the morphology of the land and its general land use, this site is chosen as the temporary settlement. 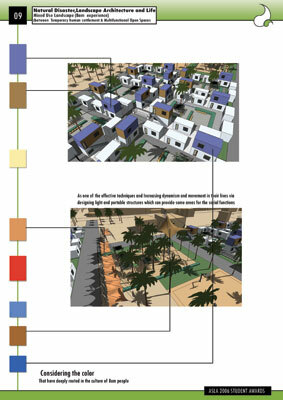 Considering the color (in particular those colors that have deeply rooted in the culture of Bam people)as one of the effective techniques and Increasing dynamism and movement in their lives via designing light and portable structures which can provide some areas for the social functions. 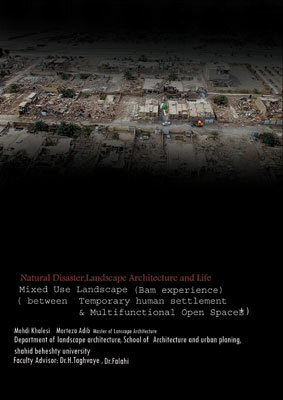 Distinguishing the remained natural potentialities after the disaster and restoring them to peoples' lives. 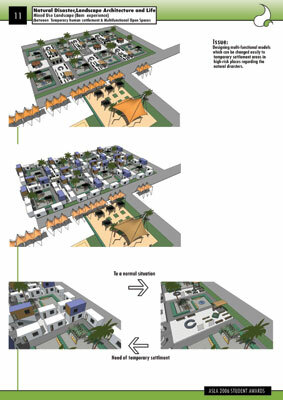 We tried to design the infrastructures and establish the emergent settlements in a way that it would be possible to change its function to some sort of tourist of university camps in long term. 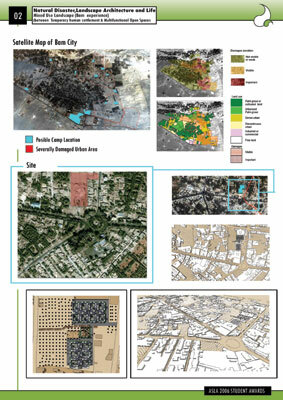 We suggest using multi-functional models in some of the urban open spaces which can be changed easily to temporary settlement areas in high-risk places regarding the natural disasters. After such events the general atmosphere is sad, death-like, and insecure. We tried using the local elements along use of colors; the local colors in particular. Use of pictures causes merriment, happiness, and life. 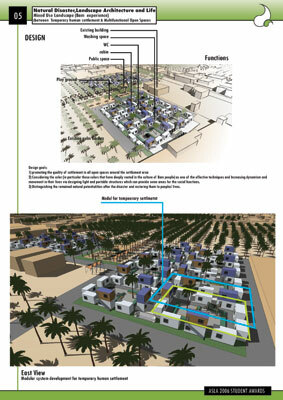 Light and portable structures which can fulfill needs at various times gives a sense of living in a human life.